I am starting this thread in hope thats others will join in. Here is where you can post your scrap page(or creation) so others can enjoy it. No obligation but if you want to say how you did it or post a template i know others would love it. I will start with this page i made for my sis. Just for fun here is my template. Last edited by ladybug on Wed Mar 28, 2012 11:52 am, edited 1 time in total. Judy, that is a wonderful page for your sister. She will love it! The colors you used are so nice! Thanks for starting this thread & sharing your template. I'm looking forward to the pages (& montages) that will be posted here. Last edited by bjt on Wed Mar 28, 2012 12:00 pm, edited 1 time in total. Thanks Betty i do hope others will like and join in. It will be a great place to show our pages. I know i fell short on template tuesdays and i am sorry for that but just knowing i would have to pick up the ball freaked me out. (one of my many phobias). Wonderful pages are being made. Show us yours my friends. Judy, I also think your page is great. I've been working hard trying to get the thousands of pictures [that are on my computer] in some sort of order. 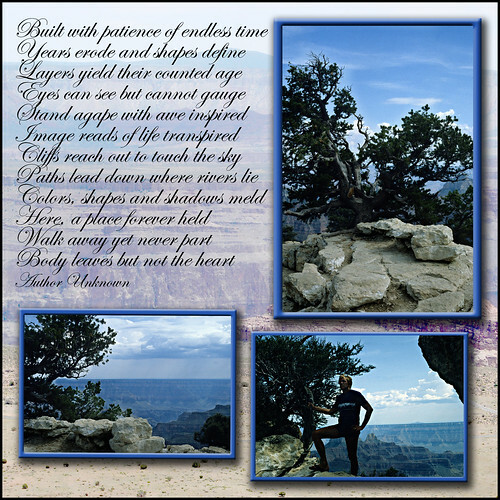 I took a break from that project and made this page from some old Grand Canyon pictures that I found. BTY they were scanned from slides. Scanning all those slides was another fun project. Lovely poem with nice photos. Glad you took a break to create & share such a nice page. I did this a couple of weeks ago. Don't think I posted it here then. I think this is a great idea with no one person coming up with a template every week. Since I babysit alot for my grandson I can't do alot in front of computer. He wants to take over the mouse. So I haven't been able to create too many templates for Tuesday templates. Judy, can you go to the initial thread and put this page link there so they know one was started. I hope Irv comes and re-posts his here, also. I love the shapes you used for your sister and Russ, you found a beautiful poem to go with your nice looking layout. I might have to save it for a future page. When someone posts their page without a template link we could scraplift the one we like and create our own to post. Irvs' looks like a good one to scraplift (the one in other thread). I will do one when he goes back home. Funny you should start this today. I was thinking about how to word it so as to include everyone and all the wonderful ideas we have on this site. Now, I need to find where I stored some I've done this winter and get going. Thanks so much. Scraplift sounds like a fun option. If I use a template (from another site) & modify it considerably, how do I handle that --- is it considered mine or is it still considered the original template? btw: Should I ever post something that someone else wants to use (wishful thinking), please feel free to do so. pretty plain, I know. But I'm still working things out when it comes to pages from scratch. I had never seen a loggerhead shrike before this year. I had the camera in hand while trying to capture another bird, when I saw something dart by out of the corner of my eye. I got one shot before he flew away & this is it. 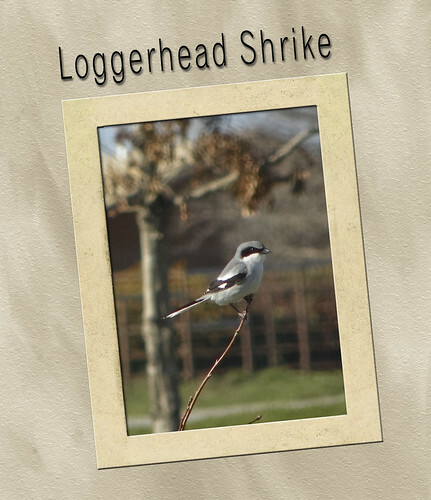 I haven't seen another loggerhead shrike since then. I feel very lucky to have had this photo op. Last edited by bjt on Wed Mar 28, 2012 5:17 pm, edited 2 times in total.